Read more about "Judging Europe's Judges"
A book has recently been published called 'Judging Europe's Judges' The book aims to study the impact of recent developments such as EU enlargement and the Lisbon Treaty on the ECJ and to examine the legitimacy of the Court's output in this novel context. The book also provides a systemic appraisal of its overall performance. Full details about the book can be found here. Upon the request of the High Judicial and Prosecutorial Council (HJPC) of Bosina and Herzegovina the ENCJ rendered an advice on proposed legislation that aims to alter the way that prosecutors are appointed. The President of the ENCJ appointed Justice Geoffrey Vos (on behalf of the Judges'Council of England and Wales) and Judge Gianluca Forlani (on behalf of the CSM Italy) to prepare the report. The report was approved by the Steering Committee and presented to the President of the HJPC Milorad Novkovic. Our former President, Sir John Thomas ( ENCJ President from 2008-2010) will be appointed Lord Chief Justice of England and Wales on 1 October 2013. As Lord Chief Justice he will chair the Judges' Council of England and Wales which is one of the founding members of the ENCJ. The Norwegian Courts Administration won an international award for their case-management system – LOVISA – for best adaptive case management system. The system excels in process support. The ENCJ General Assembly meets from 5-7 June. The meeting is hosted by the Supreme Judicial Council of Bulgaria. The central theme of the meeting is: "Independence and Accountability of the Justice System". The ENCJ is taking stock of the current developments in the justice systems in Europe as regards the accountability of the members of the judiciary, the independence and accountability of Councils for the Judiciary and the role of Councils for the Judiciary in dealing with the challnges in this field. The European Commission will address the General Assembly on the the same theme. 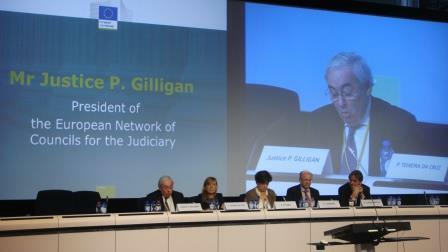 On 25 April Paul Gilligan met with EU Justice Commissioner Vivian Reding. Mr Frans van Dijk (Raad voor de rechtspraak Netherlands) and Mr Horatius Dumbrava (CSM Romania) have published an article in the International Journal for Court Administration. The article with the title "Judiciary in Times of Scarcity; Retrenchment and Reform" can be foundin IJCA Volume 5 no. 1, page 15-24. At the Steering Committee meeting which took place on 15 February 2013 in Brussels, Ria Mortier, member of the Belgian Hoge Raad voor de Justitie/Conseil Superieur de la Justice was appointed member of the Executive Board. She takes up the vacancy that was created after Geert Vervaeke finished his mandate in the Belgian Council.